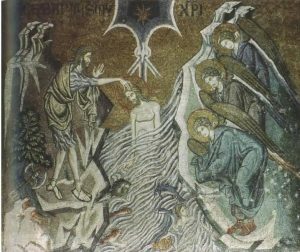 Jesus’ Baptism Based on Abraham’s Binding of Isaac? The baptism of Jesus is easily associated with Israel’s crossing of the Red Sea before trekking forty years in the wilderness, even further with the subsequent crossing of the Jordan River into the “promised land” by Israel, then again by Elijah, nor forgetting Noah emerging from the Flood. The subsequent vision of the heavens being opened can be interpreted as a transvaluation of the Exodus story — the waters parted for Israel, but the heavens themselves parted for Jesus. All of these literary sources have been proposed by various scholars and we have set out their arguments on this blog. Now it is time for one more likely source. The following is taken from a chapter by William R. Stegner in Abraham & Family: New Insights into the Patriarchal Narratives. Before I start I should refer to another work that I consider to be critical background information. Jon D. Levenson argued what I think is a cogent case for the stories of Abraham’s offering of Isaac having a heavy influence on the New Testament’s portrayal of Jesus. 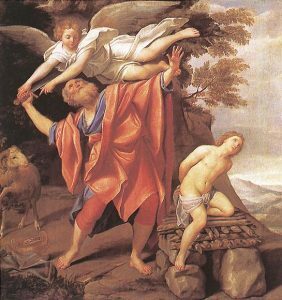 One of the most significant differences between the canonical narrative and the later rabbinic interpretation is that in the latter Isaac is said to be a mature man in his thirties and willingly giving himself to his father to be sacrificed. See my series of ten posts setting out the details of his argument. It appears that some Jewish interpreters of the Second Temple era even interpreted the Genesis account as a literal sacrifice of Isaac: Abraham was thought to have slain and shed the blood of Isaac before the angel had time to call out for him to stop the second time. Isaac was restored to life but his shed blood was believed to have had atoning power for the sins of all his descendants. Stegner also finds interesting details in the extra-canonical interpretations of the “binding of Isaac” (or akedah). Now we know that the Targums of the rabbis were written long after the first century. Sometimes, however, scholars do posit reasons for believing that some of these works originated in the Second Temple period. So we are basing our arguments on inference when we suggest that certain Targum narratives about Genesis were extant among scribes before the destruction of the temple in 70 CE. Hence my question mark in the title of this post. Each of these features of the baptism story finds its parallel in the targumic stories of the binding of Isaac. 2. A voice from heaven explains the significance of the scene: “Come, see two chosen individuals in the world; the one sacrificing and the other being sacrificed; the one sacrificing is not hesitating and the one being sacrificed stretches forth his neck. Bible scholars would say that the two stories exemplify the same form, a form often used by biblical writers to describe a vision. When a vision is described, the narrative frequently mentions the opening of heaven or a voice from heaven. In the Targums, this literary form of the vision is retained, but greater stress is placed on the content of the heavenly words than is the case in the biblical visions. The heavenly words emphasize the significance of the moment for the life of the person who receives the vision. 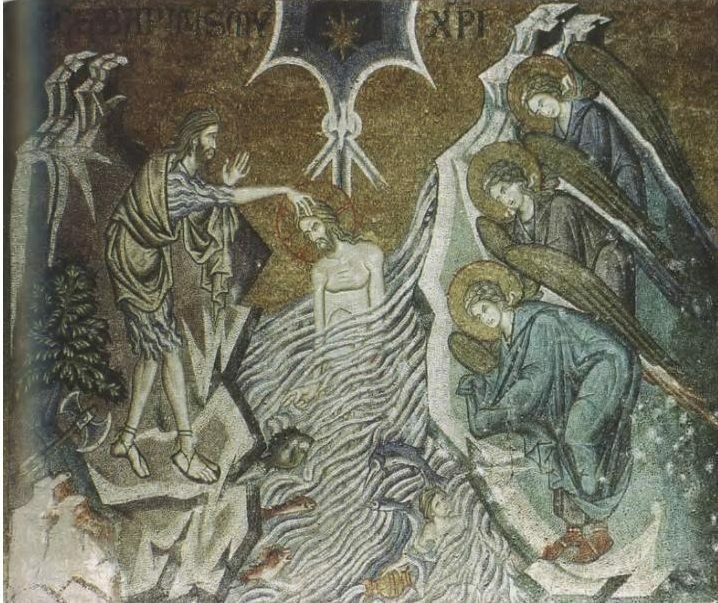 In both the baptism story’ and the binding story, however, the voice from heaven describes the significance of the scene, in one instance for Jesus, and in the other for Isaac. Both accounts exemplify the same literary form, namely the Old Testament form of a vision providing interpretive words from heaven. the eyes of Isaac were looking at the angels on high. Isaac saw them but Abraham did not see them. The angels on high exclaimed: “Come, see two unique ones who are in the world; one is slaughtering, and one is being slaughtered; the one who slaughters does not hesitate, and the one who is being slaughtered stretches forth his neck . . . . and there the Shekinah of the Lord was revealed to him. So in both the baptism of Jesus and rabbinic account of the akedah Jesus/Isaac see into the heavens and the glory or Holy Spirit of the Lord is revealed along with a heavenly voice. Thou art my beloved son; with thee I am well-pleased. The second half of the message from the heavenly voice, “with thee I am well pleased,” also finds an echo in the binding of Isaac. In effect, the heavenly voice tells Jesus that he is the recipient of God’s “elective good pleasure.” The Greek word for “pleased” is eudokeö; it can also mean “choice,” conveying the notion of election. The idea of election is found twice in the targumic accounts of the binding of Isaac. There the heavenly voice applies the Aramaic term for men elected by God (yachida) to both Isaac and Abraham. Thus, the concept of God’s choice or election is found both in the story of Jesus’ baptism and in the binding of Isaac. As the dove is chaste, so Israel are [sic] chaste. As the dove puts forth her neck for slaughter, so do [sic] Israel, as it says, “For Thy sake we are killed all the day” [Psalm 44:23], As the dove atones for iniquities, so Israel atone [sic] for the other nations. Stegner suggests the possibility (of course we cannot be completely certain) that we have here the source of the gospel image of the dove descending in the Gospel of Mark. You do not know what you are asking. Are you able to drink the cup that I drink, or to be baptized with the baptism with which I am baptized? The crucifixion, recall, is followed by the temple curtain being “torn” (schizō) — the same work used to describe the parting of the heavens at Jesus’ baptism. We often hear it said that the baptism of Jesus by John was an embarrassment for early Christians and the earliest evangelist was forced to describe it because it could not be avoided, being so well known. Well, Paul did not seem to know about Jesus’ baptism, and though we can see suggestions of embarrassment with the baptism narrative in the Gospels of Matthew, Luke and John, we see no hint of embarrassment or apology in the Gospel of Mark. Rather, it may well be argued that in the Gospel of Mark we see the creation for the first time of such a narrative of Jesus, a symbolic counterpart at the opening of the gospel to the crucifixion-sacrifice of Jesus at its end. Shanks, Hershel, ed. 2000. Abraham & Family: New Insights into the Patriarchal Narratives. Washington, D.C: Biblical Archaeological Society. Maher, Michael. 1992. Targum Pseudo-Jonathan: Genesis. Collegeville, Minn: Michael Glazier. Posted on 2019-01-14 05:18:29 GMT+0000 by Neil Godfrey. This entry was posted in Biblical Studies and tagged Akedah, Baptism of Jesus, Gospel of Mark. Bookmark the permalink.